What's black and white, sounds like actress Kristen Bell, and is standing in your living room talking to your kids right now? Don't worry, that's just Genius the Panda, an augmented reality character from the Yakables app for iPhones and iPads. 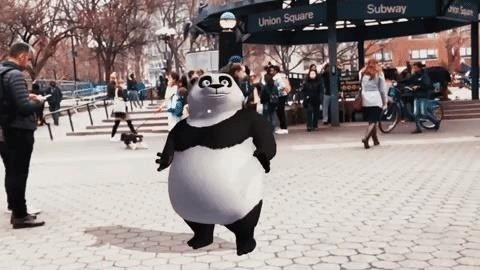 Using ARKit to place the animated panda in the user's physical environment, the app uses speech recognition to enable children to carry on a guided conversation with Genius the Panda. The app presents a series of questions on screen about pandas, such as how much they weigh or what they eat. Children can then read the questions aloud, and Genius the Panda adorably provides the answers. Alternately, kids can also tap the on-screen questions instead of interacting with the virtual character verbally. After a few rounds of interrogation, Genius the Panda (actually voiced by Grace Van Dien) flips the tables and quizzes the users on what they have learned. Kids can speak or select the correct answers from multiple choices. Yakables is a product of ZooTube, LLC, a subsidiary of Conversive, Inc. The parent company makes the Conversive platform, a machine learning and natural language processing tool that enables organizations to build conversational apps with a drag-and-drop interface. Those experiences can then be published on multiple channels, with Yakables demonstrating the platform's AR implementation. The company has also demonstrated its capabilities in VR with the "Fall in Love" experience for Oculus. With Yakables, the AR experience also functions as a promotional vehicle for the theatrical release of the documentary Pandas, which hits IMAX and IMAX 3D theaters on April 6. The film is narrated by, you guessed it, Kristen Bell. After a conversation with a panda that sounds like Anna from Frozen (another character voiced by Bell), what kid wouldn't want to see this movie? In this case, IMAX and Warner Bros. have produced an experience that not only promotes their film, but also works on its own as an educational tool for young children.